Silybum marianum has other common names include cardus marianus, milk thistle. This species is an annual or biennial plant of the Asteraceae family. This fairly typical thistle has red to purple flowers and shiny pale green leaves with white veins. Originally a native of Southern Europe through to Asia, it is now found throughout the world. 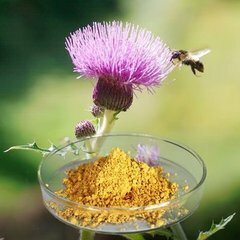 Silibinin, also known as silybin is the major active constituent of silymarin, a standardized extract of the milk thistle seeds, containing a mixture of flavonolignans consisting of silibinin, isosilibinin, silicristin, silidianin, and others. Silibinin itself is a mixture of two diastereomers, silybin A and silybin B, in approximately equimolar ratio. Application: This product is widely used in medicine, health products and food . Storage: In tight, light-resistant and dry place. Avoid direct sunshine.